on your slow days and watch sales pick up fast! 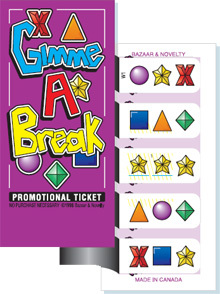 Gimme A Break is a promotional break-open ticket with 5 windows. The customer simply breaks open all 5 windows to find out if he or she has a winning combination. 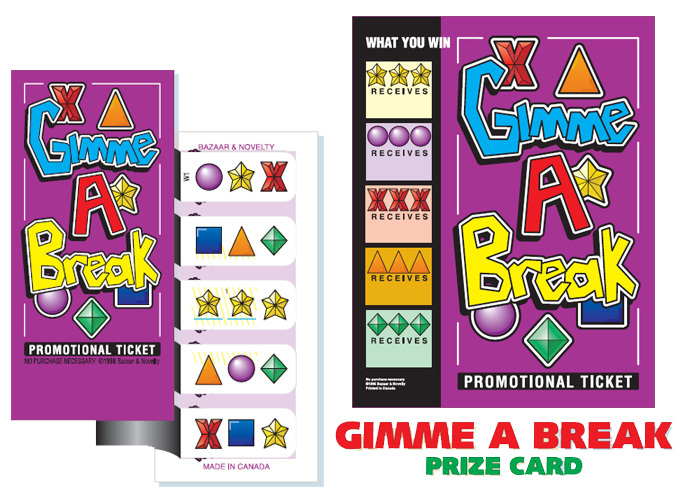 Out of 980 break-open tickets per box there are 112 winners. The 112 winners consist of: 2 stars, 2 circles, 2 X's, 6 triangles and 100 diamonds. You have complete control over the cost of your promotion. Totally flexible - you determine your own discount and prizes.